Last week, Kees calibrated and tested his self-repaired Leapfrog and the robot is printing as if nothing happened. A month ago Kees was interviewed by Bob Timroff of the Dutch tech magazine MACHINA. As an illustration with the interview Bob wanted a Steve Jobs-like picture of Kees and his Leapfrog. This could not happen because it looked like the printer was completely finished. Now it is printing great stuff again! Bob did not need the Jobs-like picture to write a great story about the Kees Kamper 3D print adventures. It’s published in MACHINA and out now. So if you are interested in the stuff we publish: buy MACHINA 8: Bob tells the ‘infill only’ story better than we do. And … at Alosery Art & Design Almere, you can even buy several editions of the ‘Paternoster’ light system. Yes, my Leapfrog Creatr 2013 is printing again. As mentioned in my previous post, my good old printer lost control over it’s X-movements: no movement, only a very ugly, grinding noise. I did some research but could not find a software problem. To check if it was a broken motherboard, I changed the X and Y wires. The problem did not switch to the Y-axis. Conclusion: this is probably an X-motor issue. I contacted Leapfrog and asked if they still had a spare motor available. They had one in stock and shipped it to me, without any costs. I was very happy, but not for long. The new motor did not solve the problem: still a grinding noise and no X-movement. There were two causes left. 1: the end-stop failed or 2: the cable between the motherboard and end-stop and/or the X-motor was broken. First I mounted the new end-stop: the problem remained. Next, I replaced the X-axis cables and suddenly my Leapfrog Creatr was back in business and I was the happiest 3D printer of the universe. Today, I tested the printer on a ‘one perimeter spiral vase’ and an ‘infill only’ bracelet. The print quality was 100%. My Creatr back on track and I feel great, because I was able to repair it all by myself. And many thanks to Leapfrog for the spare parts. I feared my Creatr died after 5 years of intense printing, but now it is ready to start it’s 6th year as a young god in an unexpected future. Bad news: after five years of very intensive usage my leapfrog Dual Creatr is seriously in trouble. Suddenly it lost complete control over it’s x-movements. It does not recognise x=o, produces aggressive sounds and goes anywhere but the right x coordinates. I did some research and think the motor which drives the x-axis is broken. But I am not sure. The question is should I invest in a five year old 3D printer? What if there are additional problems and what’s the future of an overaged Leapfrog? Conclusion to much uncertainty, so I will not invest in my senior Leapfrog. I owe a lot to this machine: it changed my life! But it is time for something new. My Leapfrog is from 2013, which means it’s unbelievable old and nowadays there are much better 3D printers available. But it’s difficult to say goodbye, so, I give my printer one last chance by asking Leapfrog if there’s still a suited motor in stock and given the uncertainty about the status of my Creatr; do they want to sent me one for free? They did not answer this question yet. As I said, this 3D printer changed my life. I never thought: “one day I will be selling light systems in art galleries”, but I do. Together with Gerard Schoone we are ‘Schoone Lights’ and this brand-new company is a very promising startup. 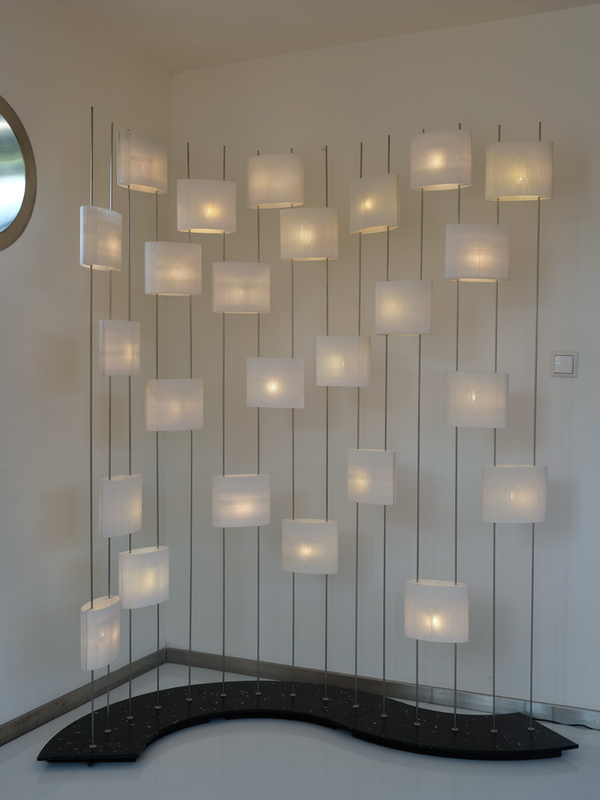 In the previous post, I mentioned that some of our lights are exposed and for sale at Gallery De Hooffzaak. They still are until the 27th of January. And there’s more: ‘Schoone Lights’ is also participating in CBKamer, where art and design talents present and sell their work. We show and sell three Schoone lights: ‘Paternoster’, ‘Geo’ and ‘Toorts’. Schoone Lights had a wonderful time at Rotterdam Design District. In fact we were surprised by the amount of positive attention our product received. Many visitors liked what they saw, but were curious about what they were looking at. Understandable, because when you see ‘infill only’ 3D prints for the first time, you might think: is it a kind of fabric or is it perhaps glass? Regular 3D prints have a plastic look and feel, ‘infill only’ products are mysterious. Some months later, at ‘MEESTERLIJK’, a 3 day event the Westergasfabriek Amsterdam (where professionals from traditional craft such as silversmiths and woodworkers together with designers and manufacturers of handmade design expose their products) we had the same experience. Many people took a closer look at our ‘infill only’ shades, but did not dare to touch them. When we told them, they could, most people were surprised. They expected very fragile material, but they experienced a strong and stiff lamp shade: nice surprise. Important notion: Schoone Lights are environment friendly: our 3D printed parts are made of fully recyclable PET. They are printed in Haarlem and only when we need them, so no stock and almost no transport. The lights are 12 volt /1.5 Watt LED systems, which means Schoone Lights use less energy than average lights. You can also contact Gerard: info@schoonelights.com for a visit at his studio. Currently, we are exposing some Schoone lights at the Go Gallery and Galerie De Hooffzaak in Amsterdam. This is a picture of the exposition at Galerie Hooffzaak. Schoone Lights (at the right) is a guest at the yearly light party of Gert Merlijn (in the middle). 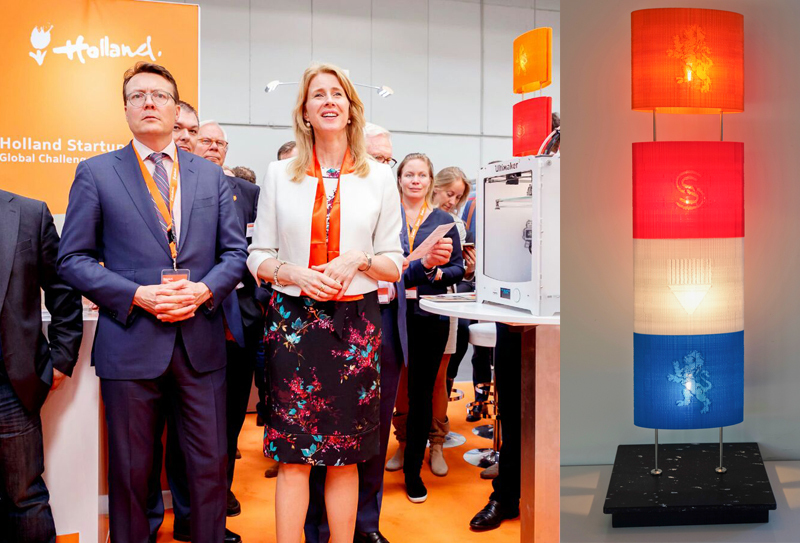 Some weeks ago we were asked to design a light with logos to present to Secretary of State Keijzer and prince Constantijn on the opening of the Dutch young tech startups pavilion of the Hannover Messe 2018. We did, and on the first of May the pavilion was opened by secretary of state and the prince. This event was hosted by a young tech company called 3D4makers. They invented a waterless production process of 3Dprint filaments. SCHOONE LIGHTS uses 3D4makers PET-G in it’s prints, with great results. During the passed two years, Gerard Schoone designed many variations of his smart light systems on 12 Volt (PATER NOSTER). Kees Kamper prototyped the INFILL ONLY parts and together they created the Schoone Light Collection. On 6, 7 and the 8th of June The Schoone Light Collection is presented at Design District Rotterdam in the Van Nelle Factory. We present several standing lights, a hanging light, a wall light and some table lights. Also present: the impressive “Wall Of Light”. …. or do you want the most minimal light you can get today? In our last post we used 3D printing to create a new part to build a better version of an almost forgotten chandelier. The same light shades we used in our standing lights, are now building a hanging light. One can also put this light system upside down and it becomes a standing light! Trapeze 02 is rather big, how about a smaller version? After some adaptations of the central 3D printed part we prototyped TRAPEZE 03. To complete the Schoone Lights collection 2018 we also needed a wall light. New modifications of the central part gave birth to WALL ONE. It’s amazing to see how 3D design and printing allows you to check out (prototype) your ideas in a very short time. Some years ago you needed a expensive molding service to build your prototypes. Today some 3D modelling and 3D printing do this trick faster and cheaper. Kees opened SketchUp and started drawing. It’s a very basic shape, so it took only an hour 3D drawing time. Next, the Leapfrog 3D printer started printing and a few hours later the first prototype was ready to be tested. Gerard took it home and checked it’s functionality. Some small adjustments were needed. Kees adjusted the model and printed a new piece. This time he used a slower speed to raise the 3D print quality. That’s how this prototype became a product, ready to build the Gerard Schoone chandelier called TRAPEZE 01. Some years ago, only big companies could afford to prototype and test new ideas. At the same time, it took at least a month before the first prototype could be tested. Today anybody can prototype and test ideas, in days. That’s one of the big powers of 3D printing. The only disadvantage: mass production is not an option. But when your idea is 3D printed, tested and proven okay, you can always use mass production methods to sell it on a large scale. ‘Schoone Lights’ is not aiming for mass production. We use 3D printing to build our products. Usually we go for ‘Infill Only’ 3D printing to print exclusive light shades, sometimes we use 3D printing to test and build missing links. The aim of this blog was to inform you about solving problems in 3D design, slicing and printing. I am still doing these things, but there’s little left to post: almost all problems have been solved by now. I am an experienced 3D designer/slicer/printer. This blog was known as ‘The opqrstu3D experience’. At the moment, my main goal is to market and sell ‘The Gerard Schoone Light Collection’ and that’s why this blog continues as ‘Schoone Lights’ (design and 3D print adventures of Gerard Schoone and Kees Kamper). In the passed two years we designed and improved our products. Today we proudly present: PATER NOSTER, a revolutionary 3D printed ‘infill only’ light collection. The PATER NOSTER system is designed by Gerard. He also designed the basic shape of the 3D printed light shades. Kees (opqrstu3D) invented ‘infill only’ 3D printing, created the 3D models, did the slicing and 3D-print-prototyping. Jasper Wille of 3D4makers is responsible for the 3D printing of our final products in 3D4makers PET-G.
All light shades are printed on ‘infill only’ settings. This unique way of 3D printing creates wonderful structures and interacts perfectly with LED light. We started building different shapes. Today, it’s possible to 3D print your logo on a basic light shade. We are able to design almost any logo by creating differences in print density. Recently we added the possibility to create logos in a different color. My next step in ‘infill only’ logo printing is using color instead of density to accentuate a logo. My Leapfrog Creatr is dual headed so it would be logical to start with color, but my machine is not capable of dual printing this kind of detailed color changes. It will print two colours in one print job, but there’s too much ‘bleeding’. My printer is from 2013. Last year Leapfrog launched a new milestone in 3D printing: BOLT. Some weeks ago I asked Leapfrog if opqrstu3D could test a BOLT on an ‘infill only’ print job. Two weeks ago I got an invitation and last Friday was my first BOLT-day. I do unbelievable things with my Creatr, but BOLT is a completely different machine. There are loads of new features Creatr can only dream of. Check it’s specs at the Leapfrog website. For this two color logo print job, the most important difference between Creatr and BOLT are the independent extruders. These allow much more accuracy in dual color printing. One small problem was the slicing. I use Slic3r, at LPFRG they use Simplify3D. With the help of LPFRG whizzkid Joeri we fitted two STL’s in one BOLT Gcode and the machine started it’s first ‘infill only’ two-color-logo print job. Opqrstu3D challenged BOLT to do something it had not done before and I did not now what to expect. The outcome was far beyond my expectations. BOLT did an unbelievable job on a daring challenge. This is the coolest ‘infill only’ 3D print ever. It’s a first try, when we fine-tune the settings it will even look better. Next, BOLT will print the Leapfrog logo. The lights I print on my Leapfrog Creatr 2013 look great because of their ‘infill only’ structure. Next step is to design and print special or personalised editions. To do this, I import a logo in SketchUp and ‘draw’ it on the shape of the light shade. I can not go into the details but in sketchUp this is a time consuming enterprise. To check out the limits of my printer, I starte with a very complicated logo. It took me nine hours to get two STL’s. I processed them in Slic3r and printed this light shade in X% infill and the logo in X-Y% infill. Amazing print job on one extruder! I had no idea my printer was capable of printing the difference in density so outstanding. Okay, the word AMSTERDAM does not look great, but it was a test to see what’s the smallest font this kind of ‘infill only’ printing can handle. Too get an idea of the scale; this light shade measures 180 times 180 mm. It takes some time but the product looks great. Let’s try another logo. Here’s the famous Leapfrog frog. Again a lot of drawing, but once drawn and sliced, these models can be printed over and over and over again. Up, we see the print at daylight, down it is lighted by a 12 volt 3 watt LED. Compared to ’27’ the shade density is lower and the logo density higher. I never use the same settings, because I want to learn how different settings influence 3D printing. I still have to fine-tune ‘infill only’ logo printing, but it’s a new and valuable opqrstu3D experience. It’s wonderful to see how differences in density enable graphic 3D printing. Un3Dprinted. Printed on yellow 3D4makers PET-G.